This entry was posted in A Grand Plan, Finance, Transit, Yonge Subway Extension. Bookmark the permalink. All praise the great Doug Ford for promising to upload the subway, and saving Toronto property owners from the tax increases that would be necessary to pay for all this! Every time the subway is down, some of which are totally beyond the control of the TTC, and how inadequate shuttle bus service always is, the obvious lack of alternative routes hit home hard. The present subway and orthodox subway technology is at its limit. Leave it to serve *Torontonians* as it was always intended to be and funded by, and let Metrolinx handle the by-pass from the regions instead. Is Metrolinx any more able? Probably not in terms of accountability, but why should Torontonians have to pay the way of exurbanites? Bad enough we can’t toll the Gardiner and Parkway. I put some of the blame at the feet of those insisting that the RL South should be subway, and not a part of the mythical RER, for which physical track interconnection would prove vastly more productive and relieve both the TTC and Union Station alike if eventually looped under Queen and west northwest up the Georgetown and Barrie corridors. Steve: For some time, Metrolinx/GO played down the possible benefits of better service on the Richmond Hill corridor, but they are starting to change their tune. It’s not a case of handling all demand from Richmond Hill with GO, but of taking advantage of demand on an existing corridor for riders where this suits their travel pattern. Of course there is also the question of GO vs TTC fares, and a good chunk of the pressure for subways to the ends of the earth comes from the idea that people can ride all the way downtown for a “Toronto” fare. The good news with the relief line is that it might be possible to build a storage yard under the Science Centre parking lots assuming the province doesn’t sell the property off to developers by the time the northern segment gets started. My question is how low ball are the TTC’s current ridership projects. Millions of square feet of new office space are going up in the core. That will surely lead to tends of thousands of new jobs, by the mid 2020s or sooner. Surely we would hope and expect a meaningful portion of those workers would commute by TTC and most likely, at least in part, via Line 1. Assuming ATC can be up and running by next year on the whole line, can that possibly buy enough capacity/time before the RL phase 1 or any further capacity improvements to Line 1 can be made? I fear overcrowding may yet get worse (which hardly seems possible in peak conditions). Steve: I think that whatever capacity the TTC adds to the subway will be consumed the day it begins operation. If you include all of the hidden costs of the Downtown Relief Line including interest and inflation, it will come to fifty billion dollars. At some point, you have to say that if the costs outweigh the benefits, then it is best not to build it. What we need is a careful cost benefit analysis done by an independent third party before we commit ourselves to the most expensive transit project in Canadian history. Steve: You have missed the point completely. 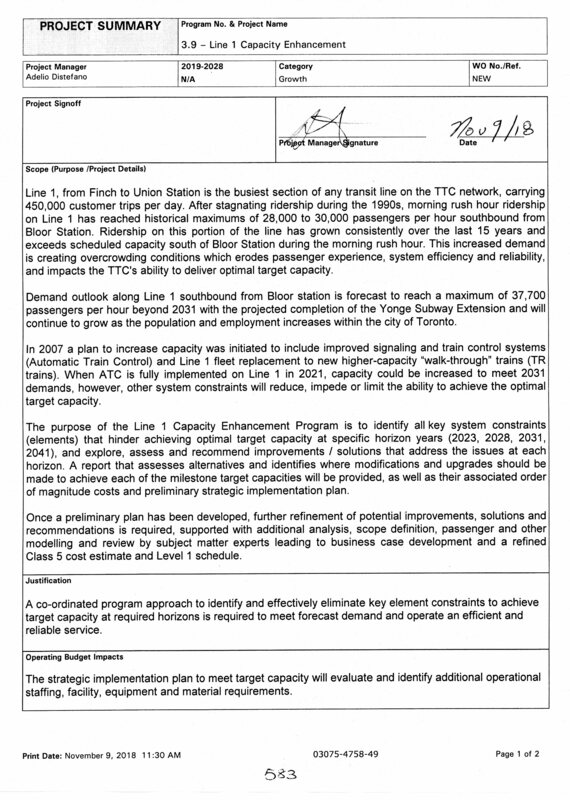 The costs for expanding capacity on the Yonge line must be incurred even if we don’t build the RL, and especially if there is no RL to offset some of the pressure on Yonge that could at least be delayed, if not put off indefinitely. And since you’re from Markham, I look forward to the point where York Region starts to actually help pay for the subway’s operation. A “careful cost-benefit analysis” of the TYSSE would show that Toronto taxpayers are getting ripped off, and I would not be surprised to see York expect the same treatment for the Richmond Hill line. Josh writes: At some point, you have to say that if the costs outweigh the benefits, then it is best not to build it. With even half that “fifty $B”…an RER service far superior in speed, reach and overall capacity can be built to loop through the core in tunnel and out on the existing Metrolinx lines to the exurbs can be built. Crossrail cost £15bn, and will run *mainline gauge trains* every 2.5 mins to start, less than 2 later through the core section. Crossrail will start with roughly 100,000 passengers a day. Paris is already attaining similar figures with her RER. This isn’t rocket science. But it is costly. And inadvertently you’ve just made the case to do a ‘total bypass’ of the TTC’s subway, and leaving it for Torontonians, the ones who paid for it and deserve a seat to work on it. Outliers can take the Provincial system. You elected Doug Ford, ask him to make it pay. And it’s not just the subway that gets relieved. It’s also Union Station. I see the present DD stock and diesels maintaining much as they do now for peak services, but the EMUs can handle all day two way to the edge of electrification. Fares can be figured out, that’s a eventual necessity anyway no matter what transpires. 50 billion for the Relief Line may seem like a lot (but with inflation, by the time we pay for it, it won’t seem like as much any more), but the cost of not building it is suspending all new development for the City of Toronto because the transportation infrastructure would be overloaded. As always you have taken the hidden pieces of the Transit puzzle and laid them out so they form a clear picture. Alas it is not a pretty one, nor is it going to be cheap. When it comes to Line 1, any rider of the line has stories of crowding and waiting at a station for a train (or several) to have space to board. And the chaos of a line shutdown is legendary. The need for more capacity is clearly evident on the trains and at the platforms. As listed, TR trains, ATC, PED, a revamped Bloor/Yonge station and the DRL have been long identified solutions to the capacity issues on the line. I am going to suggest that TR trains, even with a 7th car, combined with ATC and PED’s will not provide any relief to Line 1. I believe that any minor gains these measures provide will disappear into the maw of latent demand. I can only see three possible long term options for relief. The first is in process – the completion of the Highway 7 BRT from Yonge to VMC will allow more riders to access the York arm of Line 1 and will probably have minor effect. Funded – 1-2 years. The second – upgrade of the Richmond Hill Go Line to 2 way, all day service is constrained. CN ownership north of Doncaster diamond, the need for grade separation of the diamond, double tracking, flood plain remediation and electrification need to be worked out. 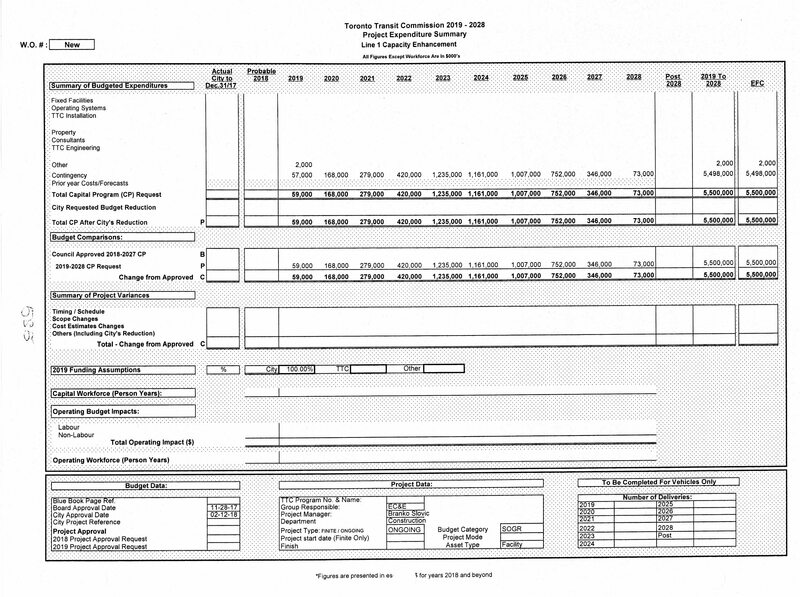 Cost estimate is $1 Billion plus – time frame unknown. The third is of course the DRL north. For it to be fully effective, it needs to reach into York Region near the 404 and 7 area. This will not stop the calls for the extension of Line 1 up Yonge, but it will provide enough relief for a few years. $3-5 Billion – 10+ years once funded. I find it interesting that the planning for the DRL south it all City led and co-ordinated. But the planning for the northern section (Pape north) is in the hands of Metrolinx. I suspect this disparity is the result of the DRL south being an original subway project of the city. and the DRL north was to be the Don Mills LRT, which would fall into the Metrolinx purview. With the construction of the TYSSE into York Region are subways considered “regional” transit like Go trains? Will Metrolinx use the routing of the DRL to replace the Richmond Hill Go train? And as Steve points out all of these transportation needs (Subway, Streetcar, Bus, Facilities, etc.) will need oodles of money. The City is supposed to have a session on transit priorities in April sometime. City staff will lay out costs and projects, council will have to set budgets and priorities. Hopefully we get some “bang” for our bucks! Steve: I fear that what we will actually get is a lot of focus on SmartTrack and the SSE, both pet projects, and some hand-wringing over everything else. It does not suit either the Tory or Ford agendas to suddenly acknowledge billions in required new spending. And, of course, ho ho ho, the private sector will pay for all of it. Given that the intention now is to push a RL South tail track up Pape to facilitate curves to and from Line 2, it seems obvious to me that the D station hereshould be added to the South scope – it lies on the common corridor for all of the scoped north options but more importantly could relieve Pape Station itself from internal crowding by intercepting 25/81 passengers, and diverting some nearby Line 2 users onto 62/87. There would also be a certain amount of walk up custom from the highrises on Cosburn. Depending on the route chosen from that point for RL North, storage tracks in the Pape/O’Connor area may also be feasible. Steve: I agree, and from the more general point of view that if there is a TBM headed north on Pape, it should just keep going if only to save on the cost of stopping and restarting the project. The trickier question would be the elevation north from Danforth and the point at which the tunnel would aim for a potential crossing of the Don River. I’m not wild about the alignment east along O’Connor as a Thorncliffe Park connection is absolutely essential. 1) Which of these projects are avoided by RL South? 2) Which additional projects are avoided by RL North? Steve: RL south alone will slow growth on the Yonge line, but the real problem there is the latent demand that will fill any new trains coming south into the core. RL south will divert some transfer traffic at Bloor Yonge, but do little or nothing for the Yonge line north of there. I am not sure how much it will offset the pressure on Yonge Station caused by the more frequent arrival of outbound trains in the PM peak northbound on Yonge. RL south intercepts more traffic otherwise bound for Yonge the further north it goes, but ideally it should have been underway by now together with improved capacity from Richmond Hill. The real difference is in just how bad the congestion on Yonge will be and the problems with station backlogs caused by running many more trains. The TTC completely ignored this problem until recently looking only at on-train capacity, not at the line as a system of stations, feeders, the subway trains and their yards. I fear we are past the point of no return and can only hope that something gets underway before the system collapses under the pressure of new riding from the 905. Does the number of stations along RL South seem unusually small compared to the other lines at similar densities or distances to downtown? I don’t have any specific suggestions for improvement, but the distance between Gerard and Pape in particular stands out – there are people right on the line who are more than a 600m walk to a station. Steve: Yes, but not a lot of them. Gerrard Station only exists on the map (a) because of SmartTrack and (b) because of the development potential of Gerrard Square. As I have written so many times, it is the surface feeder routes that make stations, not a few condos nearby. The station at King and Sumach is really strange. It will be a difficult location and will do severe damage to the neighbourhood just to squeeze it in. As for the RL North routes, I don’t see the advantage of an O’Connor route over Don Mills in terms of station locations. And, to boot, Vic Park is closer to the Uxbridge Subdivision that SmartTrack will run on. I don’t think it makes sense to jog east to Vic Park until the hydro corridor at Seneca just north of Finch. Steve: I am not convinced one way or the other on Don Mills vs Vic Park, but Don Mills has the advantage of hitting the east end of Line 4 at Sheppard. Finally, is there any reason why a station on Don Mills where it crosses the RH GO line wouldn’t make sense. Then again, station locations on the RH GO line already don’t make any sense. Steve: I don’t see the sense in creating a transfer to the RH line, but there are folks at Metrolinx who treat any crossing on the map as the opportunity for a “mobility hub” whether it makes sense as a node or not. I would hope that some consideration was given for relief for the 506 since the stretch between Gerrard Square and Parliament is where it goes from full to “riders must synchronize breathing” during rush hour. Steve: The 506 is miles away from having the level of service it could sustain with streetcars. It has an AM peak headway of 5’10” with CLRVs, and has been starved for service for years. Imagine what a Flexity every 3 minutes would look like, and that would still be less service than what runs on King today. Thanks for the digging, and platform/sharing of this basically bad news, though yup, given the past practices/experiences, having the full scope of costs and issues emerge after we’re a bit pregnant with the initial project isn’t surprising. This might be good news: maybe we could really focus on Relief function, and not a Relief stubway, and all of these extra costs of both Relief and Extension make me more convinced that we need a Reset of what’s been done, not just SSE, but also the Relief South, and of course, no Yonge Extension, (and there must be another spot to think of a subway yard without having to swallow/fund something stupid). But both the majority of the Clowncil and the Frod government are pretty dismal, if not much of our problem, including avoiding anything close to the user pay to votorists that transit riders get to pay for a lot less comfort, though yes it is true there’s a lot of money being spent on transit, just it’s not nearly investment-grade. Too bad we don’t spend far more on real planning than concrete, but the Subway Industrial Complex does have its momentum. If we could directly connect Thorncliffe to core, and yes, avoid a link with Bloor/Danforth till later, and perhaps not by subway technology, but another mode, along with Relief through the Richmond Hill GO line and other measures, would that be a better value? And, done quicker, as we are in a crisis, and waiting for another decade and billions seems impossible. Another way to help Relief would be to push St. Clair Ave. E to connect up to Thorncliffe via only a transitway through tunnelling yes, and even perhaps make further connection to St. Clair Ave. E after Thorncliffe, though the real winning route is that hydro corridor. So instead of spending plenty of millions on Relief South soil testing and land, nope, let’s hire some external planners who can’t be fired, and start on some immediate triage and planning using surface routes to go long and fast, but not necessarily with subway technologies Yes, put in the DVP, and Bayview too. And do continuity on a Bloor/Danforth bikeway, with the Danforth possibly being a bi-directional lane on the north side from Victoria Park to Sherbourne. (We have only been planning/doing bike lanes on a mywardopic basis usually; forget about something actually going well across ward boundaries, if only we did excessways like that). Steve: I am amazed by how you cling to proposals that cannot begin to address the shortfall in transit capacity. Yes there is a place for more cycling infrastructure, and not just for core-bound trips, but that’s a drop in the bucket. As for busways, as I have said many times before, even if you deal with some of the “missing links” your network requires, all of those buses have to wind up somewhere downtown on roads that don’t have room for them. I agree, but I live in the area and I’m not sure if my concerns rank as actual problems or just pet peeves (e.g. my vet’s building is going to be turning into a station entrance). I’m curious – as someone who doesn’t live/work in the area, how you think the station will damage the neighbourhood? Steve: Although the station structure has been artfully fitted in using various bits of open space, I can’t help thinking that by the time of construction it will find a way to expand. At least it’s on the south side of the expressway flyovers and so is clear of housing east of Sumach. All the same, I suspect that the presence of a station will bring pressure for redevelopment, historic buildings or no. For the record, I live at Broadview and Danforth and pass through this area regularly. That makes me less of an “expert” than a true local, but I have a feel for the place. SmartTrack Reset would be a proposed subway service with 4.5 minute headways, on a dedicated GO track. The train would be composed of cars (DMU or EMU) that would run on the GO tracks but would be of subway style, 5-6 doors per side, raised station platform level with the car floor, uni-level not bi-level and subway performance (acceleration and deceleration). The track has to be dedicated because it would use a modern signal system, incompatible with standard railroad trains. The raised platforms would be incompatible with current bi-level GO cars. The line consists of the repurposed UPX line in the west, new construction over the SRT line in the Stouffville corridor (the third GO track remains to service RER GO and to honour grandfathered railroad right of way and will require shuttle buses during construction though diversion to Kennedy and Warden Stations for many routes is possible), two tracks of the Lakeshore line from Scarborough Junction to Eastern Avenue and new construction along King Street to connect to the UPX line. The King construction is budget driven, ideally underground, next choice would be elevated and possibly surface, though if surface, would require 4 tracks to address congestion, eliminating vehicles on King. The fundamental driver of this idea is to provide an independent rapid transit route that serves downtown, feeds the suburbs and gives Scarborough a north/south rapid transit backbone. 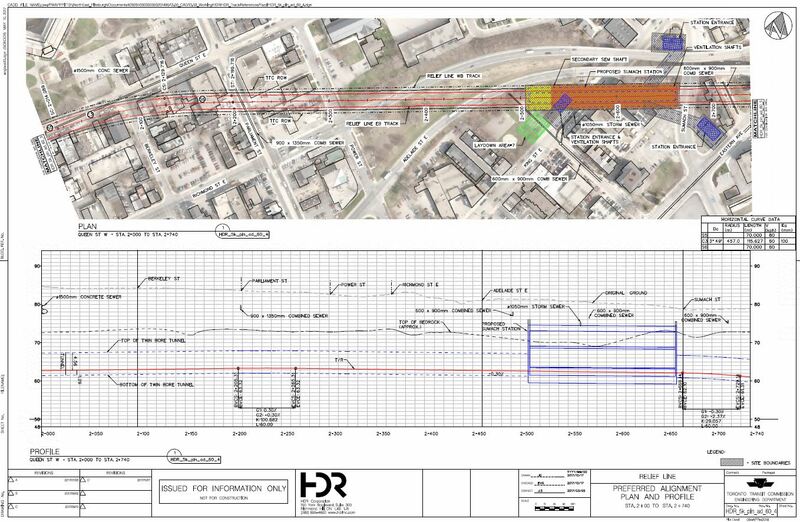 The major reason for the King Street route is a relief for the complicated Union Station re-design. It serves as a crosstown rapid transit line serving high density Liberty Village. The Yonge and Bloor lines are independent of SmartTrack Reset, unlike the Scarborough Subway Extension which is dependent. Steve: A mainline railway on the surface or elevated along King? Pure fantasy land. Does the number of stations along RL South seem unusually small compared to the other lines at similar densities or distances to downtown? I’m less concerned about the spacing than location but if you made an argument for an extra station in the east through west segment, I wouldn’t disagree. The proposed stations between Line 1 and East Harbour are in awkward and less than optimal spots because the project team wanted to provide priority subway service to Moss Park and Regent Park instead of the exploding office district on King. The King and Sumach station was supposed to provide “easy access” to jobs for low income subjects in Regent Park. To the contrary, the project team said the location of this station actually helps fix the neighbourhood up by making some claim of tying together the 2 halves of Corktown. Not that I agree with it (it’s bogus IMO) but it’s what they’re willing to say in public. This city needs to seriously think about raising more revenue. Also, we need a political group that is going to seriously craft and lobby for proposals that will change Toronto’s political and administrative status so that it can sustain itself and its infrastructure in the future and not rely on provincial and federal handouts (whether monetary or legislative). On one hand, I’m all for laying extra capacity onto the Richmond Hill GO line; simply because it would be cheaper and could be more quickly accomplished than the combo of North Yonge Subway and Downtown Relief Line. I’m including the cost of raising the track levels near the brickworks to avoid future flooding. South of Steeles, it’s also a pleasantly scenic trip. A subway ride from Toronto downtown to to Richmond Hill downtown would be a mind numbing experience, day after day. BUT, there is a huge change coming to the ‘RL’! In a year or so, it will be extended to Bloomington and will begin to syphon off thousands of riders from the Barrie line as Aurora and residents north-east of Aurora-Newmarket discover the ease of a pleasant country drive compared with the present chaos within the town boundaries of A-N.
At that point; will Doug come up with the extra cash, on top of the extra cash needed for GO Richmond Hill? Is the answer ‘none’ then? Steve: Yes. It’s a matter of timing, and possibly stretching out requirements, but not eliminating them. If studies of population and job shifts for the RL have taught us anything, it is that downtown is growing much, much faster than originally projected and all available capacity is needed “now”, not in a few decades. I’m surprised that you’re not convinced. Looking at where stations would be, nearly every location pair favours Don Mills I would think over O’Connor and Vic Park. And intuitively, since Kennedy/Uxbridge sub is 11km from Yonge, with Don Mills at 5km vs 8 for Vic Park., Don Mills is closer to the middle linearly, and a lot more appropriate once you weight for population. Don Mills would relieve more from Yonge, and intersect with both Eglinton and Sheppard at better locations. Steve: I agree that Don Mills is better, but await evaluation of the Vic Park scheme to be sure. As for an interchange with RH GO, I would think that a slam dunk. If you’re headed to Richmond Hill, it’s a good connection for origins west of the RL on Eglinton or anywhere near the RL between Pape and RH Go line. i.e. this opens up employment opportunities for the priority neighbourhoods that the RL connects. Oriole isn’t far away, but even if they do a better job of integrating it with Leslie, it’s still 2nd best for a lot of origins. And from RHC, there are/will be a lot of higher order transit options to go north and further west. Steve: An Oriole and a Don Mills Station on GO would be fairly close together, and for the Don Mills subway, a station at the RH line would be very close to the station a bit to the south at Lawrence. Moreover, the RH line only works as “relief” if it does not stop at every lamp post all the way from Steeles to downtown. RH stations south of 7 and north of Eglinton need a rethink of locations and integration, especially if they ever actually get to putting 15 minute peak service on it. Right now, it’s treated as an afterthought and represents a waste of capacity. Do BOTH! But as legs of the same project. Assume as the trend is appearing in discussion that RL will be standard gauge OHE EMUs, (fully compatible with the proposed GO electrification @ 25kVAC, single deck, as per many ‘metros’ now being built around the world. (Or Crossrail etc) It is built and run by Metrolinx (maybe via a private investment consortium as per REM in Montreal, or many other cities). One leg doesn’t subvert the other, they work in tandem. The present DD service continues as is, running down the Don on a single track diesel hauled, non-stop from Don Mills south to Union, as is. Minimal investment put into the single track to maximize utilization (signalling, control, curve banking, etc). North from Eglinton to north of Steeles, track is doubled, and shared with RL as per described in tunnel headed north. RL leaves present alignment north of Steeles but south of CN section, and ventures (most likely) to RH, either on guideways, are whatever way Markham cares to share in financing. EMU/RL runs all day two way, present GO DD service continues as is. Any investment in the present RH GO service is therefore an investment not lost when RL opens, which can be done in sections. In the meantime, first investment done on the extant single track GO line to take as much load as possible off TTC routes. DD service won’t fit in tunnel, or onto guide-ways, but doesn’t have to for maintaining present service, and recouping present investment in orthodox rolling stock. A number of points become possible by doing this: Present RL tunnelling extends to Pape/Millwood/Donlands and into the Valley where it meets present RH line in a junction, thus even before service opened north of there for passenger, stock can be moved/serviced on a yard adjacent to the present RH line. Obviously no track connections to Bloor-Danforth line, but connections made (as initially intended) at Gerrard, and connect onto LE line, thus allowing stock movement in that direction, and/or LE trains alternating into Union or Osgoode. And the obvious: Tunnelling continues west under Queen to surface around Dufferin and join the Georgetown Corridor, allowing through core looping for RER from Barrie and Bramalea+ and continuing east on the RL line or east on the LE line to Unionville. The TTC is kept completely ‘out of the loop’, figuratively and factually…and most of all *financially*! Let Toronto tweak the subway as is best for Torontonians. Everyone else can put their eggs in the RL/RER. One seat from the core to the regions! But best of all, there will be no excuse to not start tweaking the single line Don Valley route to optimize what’s there. It will continue to serve as the ‘express’ (as in by-pass) route with DD down to Union. (DD won’t fit in 6.5 metre tunnel) The costs of double tracking it just aren’t worth the investment, or intrusion. Get that line optimized in a year or so to show *immediate relief*, and then work on the RL leg in sections for the decades it’s going to take. (It could all be done in a decade, but this is Toronto). Overlooked mentioning that second phase of RL would be to branch off of RH RoW and head north again into tunnel to service Don Mills, then re-emerge to join RH line north of Science Centre if that is alignment chosen. North of Steeles, the RL line then diverges along with electrification to whatever final destination is chosen, RH being an obvious one while the present GO route continues north onto CN tracks, or if Markham/York not forthcoming with funding, RER/RL terminates at Steeles. Steve: I am not sure which is worse: Politicians’ pandering with lines to their wards, or rail fantasy maps. The track has to be dedicated because it would use a modern signal system, incompatible with standard railroad trains. Aside from the other fantasy points in Anon’s posting, I can’t resist responding to this comment. Take a look a the Four Lines Modernisation project that London Underground is implementing. There is part of the Metropolitan line where the tracks are shared with the Chiltern train service that uses DMU trains. When implemented, the new system will provide CBTC control for the LU trains and conventional wayside-signalled fixed block signalling for the Chiltern trains. In a couple of other areas, the track used by LU is owned and operated by Network Rail and is shared with other mainline passenger services. In these sections, the CBTC-controlled LU trains will be controlled to follow the fixed block indications provided by the Network Rail equipment. So, modern signalling systems can be very compatible with standard railroad trains. What is the equipment intended for RL? TR trains? Do I recall correctly that 4 cars per train is the initial design, and that the stations are not being built to handle six cars? If so, that seems very short-sighted given the 19K pdpph projected in the relief study. Does the design at least contemplate that eventually longer stations would be needed? Steve: Look at the stations on the construction drawings. The station box is about 160m long, equivalent to the six-car train length of 500ft for existing stations. Finally, some good news on the transit front. SSE is going to be built with three stops at Eglinton GO station, McCowan and Lawrence, McCowan and Ellesmere. City Council could have proceeded with the much cheaper one stop extension but Council chose to play politics and artificially withhold the SSE report until the new Council gerrymandered to give Downtown three additional Council seats which is why Premier Ford reduced the Council size and which is why the SSE report is continued to be artificially withheld. Well, Council can withhold it forever if it likes because the report on the one stop extension is now meaningless as we will get no fewer than three stops. I am also glad that the Eglinton West LRT is being buried so that the mistakes of the east are not repeated in the west. Last but not least, the Yonge subway extension is long overdue. I am disappointed that there is no immediate announcement on the Sheppard subway extension but I am sure that Premier Ford is working on it. P.S: I am NOT anti-Downtown. I simply want transit dollars to be more equally distributed rather than Downtown always getting the Lion’s share of everything when Downtown comprises only a very small proportion of the population of the region. Steve: Have a look at where Toronto’s tax revenue and job growth lie. A huge amount is downtown while Scarborough contributes relatively little. Yes, you deserve better transit, but that does not necessarily mean a subway. Report held back until there was a larger downtown contingent? No. It was held back so that John Tory would not be embarrassed by runaway cost increases in his pet projects before the election. GO is installing CBTC (Communications Based Train Control) on its lines while maintaining the way side signaling for an VIA and CN trains that happen to use the same track. Modern signaling systems can be compatible with standard railway signals. Until the California High Speed Rail project was cancelled there was going to be a section where high platform HSR trains would share track and stations with a local commuter service which uses cars identical in design to GO’s bi-levels. They were going to add high doors at the ends of the cars over the trucks for high platforms while leaving the lower doors for commuter only platforms. They were also going to install two lifts, one at each end of the car, to move handicap passengers between levels so they could board and exit at all stations. This would have been done for about $1.5 to $2 million extra per car. Fortunately saner heads prevailed. GO’s bilevels would work at high platform stations if the doors were over the trucks. The only problem is that platforms would need to be set back about 25 to 20 cm from the cars or the speed of passing freights would be limited to about 15 mph. GO trains pass high level platforms at Bloor and Weston for UP trains and the express trains do so at high speed but they tend to wobble less that freights at speed. GO is installing CBTC (Communications Based Train Control) on its lines while maintaining the way side signaling for an VIA and CN trains that happen to use the same track. GO was only looking into doing this with RFPs underway until recently. Yes it is very possible, as I described above where London Underground and Chiltern DMU trains will be sharing track with the former using CBTC and the latter using fixed block with wayside signals. GO has pressed the pause button on this project, mostly for budgetary reasons, but I wouldn’t doubt the uncertainty of what new clever ideas come from the world of Doug Ford may be a significant factor. I had a conversation with a couple of engineers from the consulting company that were looking into this and just about all the electrification and they said it would be easily done. They also commented that they could comment on the state of affairs at Union Station but they weren’t impressed or hopeful about how it would turn out. There’s a lot going on, and being undone, some of which may be not-bad news. For instance, Council just voted to ask for value-for-money assessment of whatever it is Mr. F is proposing, and Councillor Matlow did observe that oh, now we believe in value for billions?? My focussing on surface relief measures and function is far less dogmatic about mode than you kinda slag me on. The Richmond Hill GO line is unexplored in comparison to both parts of the Relief Line, (which ignores the Relief West of the 1957 plan btw,though I think Relief West is as overdue as Danforth Relief). If we did explore other Don Valley options, maybe buses, but sure streetcars, and maybe even a subway, with about 5 or 10% of it in a tunnel. But we are too focussed, or were, on a single partial fix for a huge sum in a decade, and are ignoring what all we might be able to do in the short and medium term. Yes, the short-term includes a bikeway on Bloor/Danforth – and why not? Instead of slagging it, as often a real breakdown is from a small bit of overload, why not try to ease the pressure by a small bit? The Danforth is especially wide; and check in with Stephen Wickens about how he switched from TTC to bike, and it’s a longer trip, with less safety. Even you might be able to have a safer set of bike trips now though you are a precious public resource and there can be two-wheeled passholes, not just the four-wheeled ones…. Steve: Hamish … As you know I have always advocated the RH GO corridor for some relief of demand originating north of the city. It’s not the entire solution, but it’s a part. As for BRT to the core, the problem remains of how to handle a flood of buses necessary to make a serious dent in demand on Line 1. For comparison, look at the mess Ottawa is only now replacing with their LRT tunnel. The bikeway is its own thing and does not need to be justified in terms of subway relief. If anything, you undercut your argument by linking the two. I am grateful to Steve to publish my fantasy, in allowing different points of view. 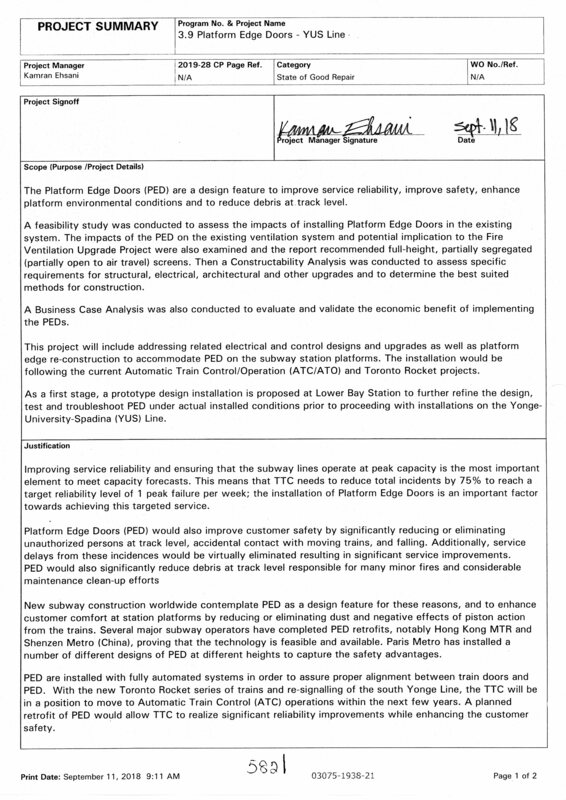 SmartTrack uses railroad signalization and Metrolinx won’t be looking into modernizing signalization until the dust settles with all its construction projects (2028). There is a big difference in station dwell time between uni-level cars and bi-level cars.